We made it! We survived the NY Bridal Fashion Week…. barely. There’s so much material to cover it’s going to be impossible to bring it all you. Maybe we’ll work on picture videos instead of pictures. We have over 5,000 photographs (not kidding). On our first full day we went EVERYWHERE. From The Knot’s Couture Show, to the Sarah Seven show, to meeting with Emmy Shoes, and BERTA. Because there’s so much to cover at The Knot’s Couture Show, we made our rounds and selected our favorites gowns. Here are our picks. We both fell in love with this Tudor style gown. 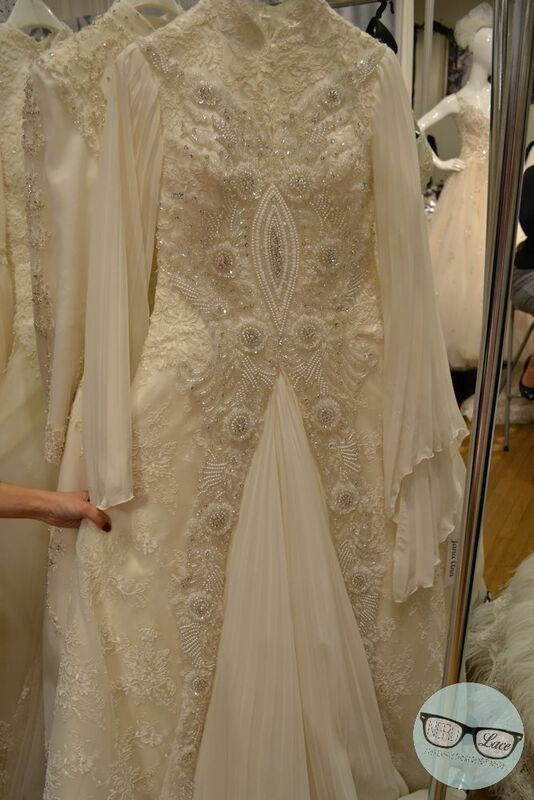 THE BEADING! It takes 30 people, 15 days to create this masterpiece. Please note that’s Jana Ann’s very hand holding the dress for us to see. She’s the sweetest! Tons more coming from our NY Bridal Fashion Week. To see previews as what’s to come, check out our instagram. Tons and tons of things on there!